Charlotte-based developer Crescent Communities is donating land at its master-planned project in west Charlotte for affordable-housing development. During an announcement on Monday at Foundation For The Carolinas, which created a Housing Opportunity Investment Fund in May to finance affordable housing in Charlotte through the private sector, Crescent said that it would gift 4.5 acres (valued at $2 million) to build 124 income-restricted apartments at River District, a mixed-use development encompassing 1,400 acres in west Charlotte. Charlotte-based Laurel Street, which builds mixed-income housing, will develop the affordable units at River District. The housing, part of a mixed-use portion of River District, is expected to break ground in 2020, with units ready for occupancy in 2021, Mansfield said. 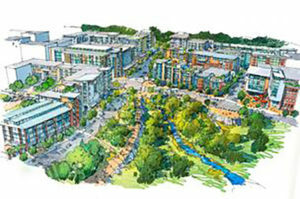 A site plan indicates 53,000 square feet of retail, 19,000 square feet of office, 606 multifamily units, 60 townhouses and 35 single-family residential lots, in addition to a working community farm, are planned for that initial development phase of River District, at the intersection of the future West Boulevard extension and Dixie River Road. River District, situated between Charlotte Douglas International Airport and the Catawba River, is expected to include up to 8 million square feet of office, 500,000 square feet of retail, 1,000 hotel rooms, 2,300 single-family homes and 2,550 multifamily units, to be built over several decades. Crescent is developing River District with another Charlotte developer, Lincoln Harris, and the firms intend to preserve 550 acres of the site. Elizabeth McMillan, director of development at Crescent, said the West Boulevard extension and improvements to Dixie River Road, including adding bike lanes and multi-use paths, will be worked on over the next year, before the first real estate phase breaks ground in 2020. The farm will have a connection to the commercial piece and all uses will be integrated, she continued. Laurel Street’s project at River District is anticipated to include 20% of units for residents making 30% or below the area median income, 50% of the units for 60% AMI and 30% of the units for 80% AMI, said Dionne Nelson, president and CEO of Laurel Street. Nelson said at least half of the firm’s portfolio has been with partners but, typically, they are churches. “It’s exciting to have a market-rate, mixed-use developer come to us and have that same conversation, and we think there are opportunities to do more,” Nelson said. The affordable-housing development at River District will require state tax credits and money from the Housing Trust Fund or the Housing Opportunity Investment Fund. Nelson said Laurel Street is “highly certain” they will receive the financing to get the project underway. Laurel Street intends to seek 4% housing tax credits. Having the land donated is significant, Nelson said, because the project will subsequently require less subsidy from other sources. “That pot of $100 million now goes further to build more units because our ask will be reduced based on the gift from Crescent,” she continued. Mansfield said he expects more affordable housing at River District in future phases. As part of Monday’s announcement, Wells Fargo & Co. (NYSE: WFC) said it would commit $6 million to expanding its NeighborhoodLIFT program in Charlotte, which provides downpayment assistance to homebuyers. It will also give $3 million annually between 2018-2020 to Charlotte nonprofits that focus on issues like affordable housing, workforce development, small business development, financial empowerment and neighborhood revitalization. Wells also pledged $5 million to the Housing Opportunity Investment Fund. Michael Marsicano, president and CEO of Foundation For The Carolinas, said Monday that the Housing Opportunity Investment Fund has so far hit more than 20% of its $50 million goal that would match the city’s $50 million Housing Trust Fund should the bond referendum be approved by voters in November. The foundation said in May it would commit $5 million to create the Housing Opportunity Investment Fund.